The NWI Times reports that only a “limited number” of children at the West Calumet Complex have been tested for elevated lead and arsenic levels. According to city data only 263 children under 7 have been tested out of the 670 children living there. Thirty-three have shown elevated blood levels. The Associated Press reports the opening of a second “one stop shop” health site. Not all zone 2 residents (Calumet) will be waiting until next year to have toxic soils removed from their properties. The EPA announced yesterday it will remediate 13 properties before years’ end, and will recoup the costs later from the companies named in the 2014 consent decree, which excluded zone 2. Resident’s concerns over water quality are also being addressed. The EPA is testing resident’s basements for traces of lead and arsenic resultant from flooding and seepage. The EPA is also testing drinking water quality during excavation, and residents are to receive water filters while their properties are cleaned. 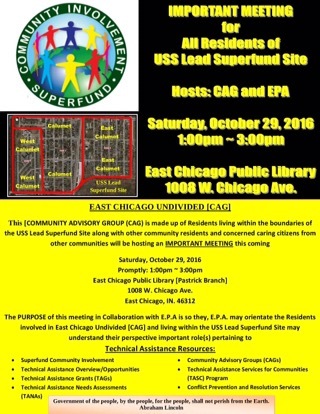 A representative from the EPA who specializes in community advisory groups will present at a meeting of East Chicago Undivided this Saturday.